Last night I went to a lecture hosted by the Ottawa Interaction Design Association to see Dan Saffer speak about Microinteractions. The event is part of a book tour Dan is doing for his new O'Reilly book by the same name and a quick glance at his site will tell you that this a popular design topic because his talks are selling out one after the other. Microinteractions are the "feel" part of look and feel. They are small little actions that live inside your features but alone, don't really qualify as features. For example, the ability to turn off your ringer isn't a reason to buy a phone, but it's an interaction that you may still have with the phone. Paying attention to these fine details as well as the big picture will permit users to have a great experience using the product. It's the difference between a product you tolerate and a product you love. 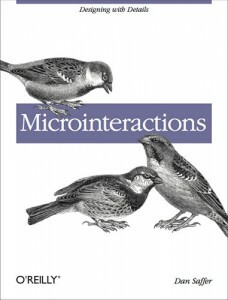 Microinteractions are good for: accomplishing a single task, adjusting a setting, connecting devices, interacting with a single piece of data... etc. Dan's presentation was filled with relevant examples and provided a ton of food for thought whether you're a developer or a designer. I tried to document as much of them as possible but there. was. so. much. If you're lucky, you might be able to catch him somewhere along his book tour and take in the full presentation. Meantime, if you'd like a taste, I'm happy to share with you my copious notes (on Google Drive). Enjoy!